This week marks the establishment of the U S Naval Quarantine of Cuba in 1962. President Kennedy ordered the Naval blockade and associated diplomatic actions in order to convince the Soviets to remove nuclear weapons they had clandestinely placed in that island nation. In a sense, one could say Mr Kennedy and his advisors hoped the quarantine would “sanitize” the island of the threat posed to the United States by having nuclear armed missiles just 90 miles off our coast. We normally think of the term quarantine in a medical context: the sequestration of infected patients to prevent the spread of contagion to the general population. Our notions of contagion and of a response to it emerges from the earliest time of written history. Gabriel and Metz, in their two-volume History of Military Medicine quote a Sumerian physician’s letter to a family that was housing a sick person giving strict orders that ‘no one should drink in the cup where she drinks, …nor sit in the seat where she sits,…no one should sleep in the bed where she sleeps’ (he goes on to advise that she stop seeing visitors because her disease is sabtu, “catching)–as evidence that Sumerians (4,000 – 2,000 BC) had some notion of hygiene and contagion. The authors go on to cite Sumerian cautions about avoiding mosquitoes and flies (Nergal, the Mespoptamian god of disease and death was personified as a fly) as further evidence of their practical understanding of insects as vectors for disease despite “official” demon theories of disease operative at the time. By around 1000 BC, Mosaic laws called for quarantine of sick persons or families for up to 40 days, with ritual purification of the clothing, house and possessions of the sick, if the illness did not abate. Vivian Nutton tells us that “Thucydides, in his Greek account of the Athenian plague, talks about the passage of disease from person to person without any hint that this opinion was unusual.” He goes on to say, however, that neither the Greeks nor the Romans appear to have understood the significance of this person-to-person spread of illness to make the conceptual leap to “quarantine”. From the late Roman empire until the European Renaissance, it appears that, from the standpoint of public health measures to prevent contagion, things went from bad to worse. By the 12th Century, Islamic medical writers, who had in the 9th and 10 Centuries assiduously translated and adopted the wisdom of ancient Greek medical authorities, were now often criticized for describing the plague as contagious. Peter Pormann and Emilie Savage Smith tell us that while debate raged on, Islamic doctors now generally sought the cause of disease in demons, or even the Deity himself. In Christian Rome and Europe of the post-Roman era, theological causes and cures for disease were propounded and even celestial bodies invoked as a cause for disease. David C. Lindberg cites as an example the medical faculty of the University of Paris conclusion that the black death of 1347-51 had been the result of a corruption of the air caused by the conjunction of Jupiter, Saturn and Mars in 1345. By the late fifteenth and early sixteenth centuries, however, medical humanists were beginning to produce new translations of ancient Greek medicsal authorities, and of Arabic translations of the same writers. As a result, a spirit of empirical observation began to permeate medical thought, as physicians began to look for natural causes for disease. According to Guenter Risse, repeated waves of the devastating black death prompted local governments– first in Italy then spreading throughout Europe–to institute public policies to deal with the contagion. Initially, these policies aimed to blunt the impact of epidemic by denying entrance within city walls of sospetti–plague victims, and their possession, including cargo. Within cities, authorities isolated the sick in their homes, and saw to it that the filth causing the stinky miasma suspected of spreading the illness was cleaned up. After 1400, cities in central and northern Italy began to appoint health commissions to deal with epidemics. In 1423, the city of Venice established a lazzaretto on an island in the Venician lagoon specifically for the isolation of foreign traders suspected of carrying pestilence–and their cargoes. That these sospetti were to be isolated for 40 days is taken to have given the term “quarantine” its name, being derived from “quaranta”–Venetian Italian for 40. During the plague of 1468, officials of Milan studied the transmission mechanisms of the disease through careful contact tracing. This work confirmed the important role of contagion in the transmission of plague. After 1500, governments gathered intelligence about the movement of plague throughout Italy and the Mediterranean basin by utilizing a troop of disease spies on the public payroll. The major late 19th and 20th Century innovation in epidemic control was the institution of mass immunization, first against smallpox, starting around World War I, and now most notably against rapidly emerging influenza strains. Today, governments and international agencies have active disease surveillance programs in place throughout the world. In the 2005 bird flu scare, the Centers for Disease Control and Prevention sought strict rules for identifying and tracking potentially ill travelers, while the Chinese government and others isolated travelers identified by remote fever-detectors. Meanwhile, pharmaceutical companies worked feverishly to produce vaccinations against the newly virulent strain of virus. Lessons learned during and since the European renaissance are applied in today’s world. And insofar as we give it the name “quarantine”, one response to epidemic disease arose in a maritime nation–Venice. And so maritime medicine can claim some historical credit for any success we enjoy in contagion control today. Society member and Dutch military historian Leo van Bergen (et al) recently published the article From Goya to Afghanistan–an essay on the ratio and ethics of medical war pictures in which they explore the appropriate role(s) of medical imagery, particularly of combat injuries, in democratic societies. First, van Bergen and his colleagues briefly review the history of war imagery, citing the use of paintings (Goya after the French counterinsurgency effort in Spain, 1810-1820; Otto Dix and Georg Grosz, during and after World War I) and later photographs (Dutch surgeon A van Teinhoven and Ernst Friedrich after World War I) as a means to encourage anti-war sentiment by depicting the horrors of war through the wounds suffered by combatants, or by those bystanders who become victims of war. 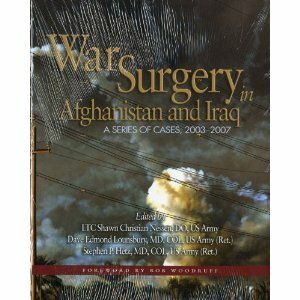 Van Bergen and his colleagues worry about what effect the images published in the U S, War Surgery in Afghanistan and Iraq: A Series of Cases, 2003-2007 (2008) and intended, according to the book’s editors, for the education of military surgeons “on the plane before they get there”, might have upon a civilian populus not educated about the purpose of such imagery. They note that these images portray the particularly horrific injuries wrought by modern IED-type weapons. They also particularly note that this book was published “as a heavy coffee table book”, and wonder why the book’s editors selected this quite un-textbook format, in view of their educational intent. The authors briefly describe that some in the U S military medical community sought to prevent the book’s publication or attempted significant censorship of the images specifically because of the concern that they could very well cause a popular backlash against the ongoing counterinsurgencies, and against war in general. But in the end, Army officials permitted the publication of War Surgery with the full panoply of photographs selected by its editors. After discussing 20th Century medical illustration of combat injuries, starting with physician-artist Henry Tonks’s renderings of the terrible facial wounds managed by British plastic surgeon Harold Gillies, to the more “sterilized” images of wounds as depicted in inter-war texts, van Bergen and his colleagues point out that the War Surgery is dedicated to the perspective of “immediate trauma care”, that is, an unvarnished rendition of the cold, hard truths of combat injuries in modern war, accompanied by textual narrative that adds clinical information not available from the photographs. Just as we who have not experienced combat ourselves feel unworthy to ask friends and relatives who have “been there” to “tell us about it”, it is very possible that the average citizen feels similarly unworthy to view the injuries and the suffering portrayed in War Surgery, both because he didn’t experience combat, but also because he is unable to participate in repairing the damage he sees. One wonders, in passing, if people may also be as horrified by the creators of the weapons that cause the wounds as they are by the wounds themselves. Perhaps these are the reasons why we have seen virtually no popular reaction against the current military efforts based on the medical images in War Surgery. This week, I’m attending the 2010 Congress of the Naval Order of the United States, in Sparks, NV. The theme of the meeting this year is “100 Years of Naval Aviation”, marking the beginning of an epochal Naval development. The meeting was widely promoted among Naval Order members, a terrific selection of side events (including a visit to the Navy’s “Top Gun” school in nearby Fallon) planned, and an enticing venue selected; yet attendance is down, continuing a many-year trend. I venture to say that most people accept the notion that conferences offer valuable opportunities for the cross-fertilization of ideas among people of similar or complementary interests and disciplines. Conference attendees also look forward to the social interactions and networking opportunities that meetings offer. Yet many organizations with which I’m familiar are experiencing the same trend–decreasing participation in annual meetings and even local events. Why is this? What to do about it? Certainly the bad economy, with the attendant decrease in funding by business, academic institutions and government has had an impact over the last couple of years. But I think the trend of decreasing conference attendance began well before the current fiscal difficulties came along. The internet no doubt has played a large role, given the ease of communication, document transfers and collaboration, and even video conferencing it provides. Increasing specialization has sliced many disciplines into ever-smaller communities; the resulting specialty gatherings are smaller and more narrowly focussed, offering proportionally diminished conference rewards. But there’s more. With cuts in funding have come cuts in staffing. This means that people who still are on the job in business, the academe and government face pressure to do more, work longer hours, and take less time for such “luxuries” as scholarly or business meetings. Of course all this disproportionately impacts younger workers and scholars–just the people who’d most benefit from all that conferences have to offer. One result we should fear most: an increasing isolation and regionalism in thinking, with a resultant slowing of intellectual development and evolution within and across disciplines. So what to do? Clearly, the internet with its attendant amenities is here to stay. But internet-facilitated collaboration is at best a few-person endeavor. On-line conferencing can put large groups of people into one time-and-intellectual space, but these efforts last at best a few hours and come no way close to the several-day and several-session intellectual salad-bowls that physical conferences offer. One strategy that smaller organizations can adopt is to mount conjoint meetings with larger, “umbrella” organizations. For example, The Society for the History of Navy Medicine (the sponsor of this blog), which occupies a tiny niche in the historical world, very early sought constituent status with the much larger American Association for the History of Medicine, and held its first three annual meetings as panels with AAHM. A recent Board decision to reach out to the Society’s other “constituencies” has it mounting a panel at this year’s meeting of the Association of Military Surgeons of the United States (AMSUS), representing the large community of federal health care workers. Another consideration has to be the venue. We had hoped to mount a panel at next year’s meeting of the Society for Military History seeking outreach to the community of military historians. However, several potential panelists cited the venue for next year’s SMH meeting, Lisle, Illinois, as a reason why they would not submit a paper proposal, and so we have had to abandon this effort. The prospect of mounting a panel at the Naval Academy in 2011, however, seems to have piqued the interest of several authors. I encourage your comments on this topic of increasing relevance to modern scholarship. [18 October] For more on this topic, see the CNN blog on the topic. Historians have to love governmental obsession with record-keeping, an obsession that we can trace at least to Sumeria (2800 – 1900 BC) in the middle east, the Roman Republic and Empire in the west and to the Han dynasty (206 BC-220 AD) in China. Records from those eras, and more recently, provide rich grist for historians’ mills of research, study and analysis. Late last week, the BBC and other news outlets reported that the National Archives of Great Britain released detailed catalogs of naval surgeons’ logs from the 18th through 20th centuries. These reports, written contemporaneously by doctors stationed on Royal Navy ships and shore establishments around the world provide some quite remarkable pictures –often literally, with drawings in color–of medical conditions and treatments, conditions and life aboard ships, even weather and geographic information. 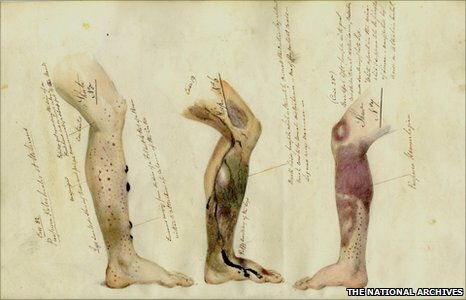 Included are such records as that of Surgeon Farquhar in HMS Theseus, in which he describes amputating Horatio Nelson’s right arm after it was struck by a musket ball during a Nelson-led assault on the Spanish island of Tenerife, in 1797. The contents of the journals are extensive and detailed, as described by archival records specialist Bruno Pappalardo in this podcast. Unfortunately, the records are not digitized. This just means that researchers have but another excuse to visit Britain and the National Archives in Kew, Richmond, Surrey, UK.